The Govt. of India has recently affirmed through a circular through DIPP that Foreign Direct Investments in E-Commerce companies is allowed upto 100%. There is cheer among a few although there are clauses and causes for worry for many. The notification says that 100% FDI is allowed only in companies that operate as a Marketplace and not on those who operate with their own Inventory. Amazon, Flipkart, Snapdeal and PayTM are the big Four Marketplaces in India and so is my own startup Oyethere.com. In these models, the company doesn’t own any inventory and merely facilitates the sale of products between Retailers/Sellers and Customers. Marketplaces bring together the above-mentioned two parties and complete the transaction. There are several variations here too. For instance, some marketplaces merely connect the buyer and seller (OLX) and the money is paid by the buyer to the seller directly. A majority of them including Flipkart and Oyethere.com collect the money from the customer while the Retailer provides a Bill/Invoice to the customer. The Marketplaces then repays the Retailer with its Sales value after deducting commission, if any. However, there is a catch for the big two companies, Flipkart & Amazon. Flipkart has a subsidiary company by the name WS Retail which is the largest seller on its own marketplace. Similarly, Amazon has a 49:51 JV with Cloudtail which is owned by Catamaran ventures, which is in turned owned by the family office of NR Narayanamurthy, Chairman, Infosys. These two companies could face issues because the DIPP Notification on FDI states that no more than 25% of Sales can be derived from one seller in the marketplace. This could be a potential spanner in the scheme of things until these large companies find a legal way out. The most affected ones would include the likes of ZivaMe (lingerie), Urban Ladder (Furniture), Hopscotch (Baby Care) YepMe (Fashion) which has Shah Rukh Khan as Brand Ambassador and is also an Investor, Myntra (Fashion) owned by Flipkart and many other small and budding Ecommerce players who have already received foreign funding or are in the process of raising one. These companies are legally not allowed to receive FDI more than 49% which would never be possible. Having said the above, the biggest beneficiaries would be the offline Retailers like Viveks Ltd. (Consumer Durables) who have already been selling online through Marketplaces. 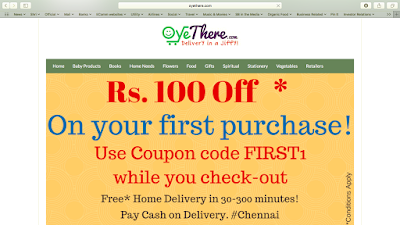 Oyethere.com also enables offline retailers like Café Coffee Day, India’s largest café chain with over 1,500 cafes across the country, Brown Tree (Organic Food), CeeDeeYes Supermarket, Smiling Baby (baby shop) and many others to sell their products online through its portal thereby facilitating the sale between the Retailer and consumer. I am personally meeting several Retailers to convince them to come on board our startup Oyethere.com and benefit from the incremental business opportunity without spending a dime on Marketing or Business Development. There is a deterrent to Marketplaces as well – they are not allowed predatory pricing, meaning they cannot unduly discount the prices of products and ensure that the prices are merely competitive. This brings a lot of trust on marketplaces like Oyethere to Retailers because they are sure that they, and not the marketplaces, have a final say on the final pricing of products. One of the promises of the Narendra Modi Government in their election mandate was that they would not allow 100% FDI in Multibrand Retail. And they have stuck to their guns. However, Ecommerce is seen by the Government as an enabler of trade and not a threat and hence this move which is expected to benefit very large marketplaces like Amazon and Flipkart and newbie startups like Oyethere.com. Look forward to some interesting days ahead in this space. Women have played a very important role in my life. My Mom who gave birth to me, my Aunt, who brought me up, My wife who is my pillar of my success and my two little girls who always, always bring a cheer on my face. So on Women's day this year, I wanted to extend gratitude to ordinary women who are doing extraordinary service in the society that we live. As part of an intitiative from my startup OyeThere.com. I identified eight women of yore who are self made, successful and have brought cheer to the society. I prepared the list and reached out to them in the first week of March and all of them agreed to meet me. So, I went to their respective places on Tuesday, 8 the March 2016 and handed over a small momento from our side. My first visit was to meet Ms. Kamakshi Subramaniam, She is an Octogenarian and an active social worker. She was responsible for reviving the Schmidt Memorial at the Besant Nagar beach among other things in the city. She is a great inspiration for people like us to take an active part in the society and help the less fortunate ones. Next I met Ms. Mathangi Srinivasamurthy, one of the ace Entrepreneurs from Chennai who set up and runs the iconic Anokhi Cafe and Retail Store in Chennai (at Alwarpet). The cafe is a popular hangout in the city and is rated among the top 10 must visit retail outlets in Chennai. Her team is doing a commendable job in keeping their customers elated. Ms. Veena Kumaravel, along with her husband Mr. CK Kumaravel runs the country's largest and most respected salon chain, Naturals. What started as a company owned outlet in Chennai at Khader Nawaz Khan Road more than a decade back is now spread across the country and is mostly run by Franchisees across the age groups and gender. She is credited with empowering home makers turn powerful Entrepreneurs. Next, I visited Ms. Shoba raman, principal of Vidya Mandir School, Mylapore. She has been with the school for over 20 years and has grown the ranks. She is credited with imparting high quality education with an extremely hardworking and sincere group of teachers who work tirelessly for the welfare of the students. Ms. Sridevi Raghavan was pursuing her MBA at Harvard Business School and identified "on-site child care" as an extremely useful idea for women to get back to their workplace after delivering their baby. She and her husband Mr. Raghavan run the most respected Amelio Play School which has a dozen centres across Chennai and Bangalore. Dr. Rekha Sudarshan is a wellness and lactation consultant. She helps new mothers and trains them in the process of breastfeeding their little ones while also imparting the importance of mother's milk to the babies. She is a demi-god to thousands of mothers and their little ones. Ms. Shaktisree Gopalan is an Architect from Anna university, Chennai and is a popular singer, who has pelted some very molodious and memorable numbers for various music directors. She was responsible for designing the KM Conservatory, the music shool run by Oscar Winner and Mozart of Madras, AR Rahman. It was quite humbling to meet these women in a single day and spending a few minutes with them. I wish and pray that these women keep doing their selfless service to the society in times to come. And I also sincerely hope that this Oyethere.com Women's Day felicitation grows in size year after year.